It's time for summer TV y'all! I've watched several of the new shows on the air, and I have to admit that while none of them thrill me, they'll do for now. The Closer and Damages both come back in July and those are both excellent shows so I'll be happy then. 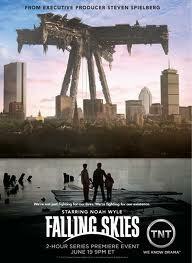 I watched the premiere for Falling Skies, and I enjoyed it. Can't help it, even though it wasn't exciting, exciting, it was enjoyable for me. I just love the post-apocalyptic vibe of shows like these. Even though the aliens don't look terribly believable, they can obviously cause a lot of destruction and reading a few speculations online, makes me think there might be even better things to come. I do appreciate that there is a character of faith. Even though she was introduced clumsily and a bit holier-than-thou I have HOPES that the show will take the opportunity to explore what a person of faith would feel/experience/go through in a situation like this. So...fingers crossed. On the flip side, WHERE ARE THE GIRLS? I can't help but notice that the show is already heavily favoring the male POV. There a few female characters but their roles are minimal so far. I can only hope that changes, but I know better than to expect more, sadly. One scene in the show got me thinking. As the resistance packs up to move on, Tom Mason, the main character stops by a huge pile of books. He picks up two of them, 20,000 Thousand Leagues Under the Sea by Jules Verne and Tale of Two Cities by Charles Dickens. He considers for moment, and ultimately chooses to keep Tale of Two Cities. Because of the nature of the world they are living in, you know the decision on what book to keep is weightier than the ones us book lovers make constantly when pruning our shelves. It got me to thinking...imagine you entered the post-apocalyptic world in a book you enjoy and could only choose to keep one book. What book would you save? What book would be most important to have in a world where survival was unknown and reading time scarce? What book would you want to make sure future generations would have? For the sake of this discussion, religious texts are off limits. Please choose a fiction book! :) If you share what book you'd save and why, I'll compile all the answers for a future post. So..what book would you save?